Warner Bros. Studios and IMAX take over Disney Studios duties by providing audiences with a spectacular documentary, complete with story about the most adorable animal in the world – PANDAS. PANDAS is an IMAX original movie. PANDAS is not a film comprised of short clips but one that contains a story with a solid narrative set in both Sichuan, China and New England, United States. The story revolves around a Panda called Qian Qian. She is the star. And the audience will surely love her. 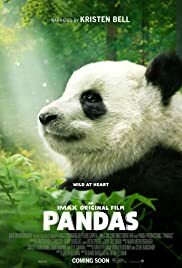 When the film opens, the narrative (voiced by Kristen Bell) informs of the diminishing number of pandas in the wild – less than two thousand. Owing to humans destroying their natural habitat, they are forced further and further higher up the mountains in northern China. It would have been miraculous if the film could have captured shots of wild Pandas. The film then rests on Pandas born in captivity. Qian Qian is one such panda. The goal is to prepare captive born pandas for survival in the wild and let them increase the Panda population. Qian Qian is chosen. The film follows her training from cub to young adult. The heroes of the story are the human being Panda experts Wen Lei Bu, Jacob Owens and Rong Hou who are involved in the training. They also enlist the help of a New England black bear expert, Ben Kilham to train Qian Qian. When Qian Qian is released into the wild in the mountains of Sichuan, a collar is put around her neck to monitor her movements and to know when she might be in distress. This is the Panda story. The film contains many candid shots. 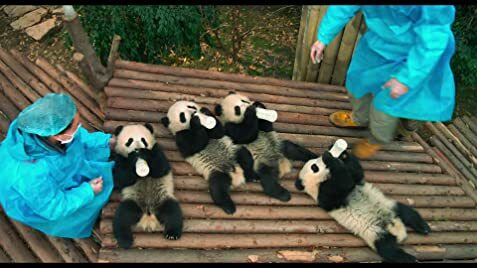 The best of these is the one in the panda facility where human beings clad in medical outfit feed the 4 baby panda cubs with baby milk bottles. One other is the panda star, Qian Qian injured up stuck in the tree. The doc is quite short with a running time of 50 minutes or so. It is a question of quality vs. quantity. PANDAS come highly recommended!